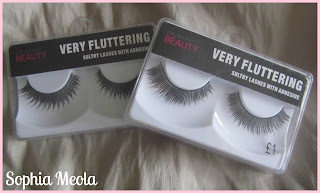 A few people have mentioned to me that the Primark Eyelashes are actually really good. They know people who do Beauty at College and University and these are what they use, purely because they're cheap and natural. Personally, i have never used then before, however, due to everyone raving about them i've decided to give them a go :) So as you can see from the picture above, i purchased two pairs at £1 each. As you can see from the picture they are very natural looking. Primark do a wide range of lashes, some very extravagant, shall we say which you can tell the quality is not that great, however, these looks very similar to an Eylure set.